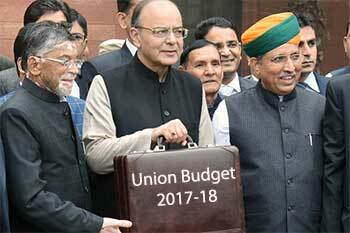 The first united budget of the country since 1924 and it contains 3 major reforms. First, presentation of Budget advanced to February 1 to enable the Ministries to operationalise all activities from the commencement of the financial year. Second, merger of Railways Budget with General Budget to bring Railways to the centre stage of Government’s Fiscal Policy and Third, removal of plan and non- plan classification of expenditure to facilitate a holistic view of allocations for sectors and ministries. In the last two and half years, administration has moved from discretionary, favouritism based to system and transparency based. Inflation brought under control. CPI-based inflation declined from 6% in July 2016 to 3.4% in December, 2016. Economy has moved on a high growth path. India’s Current Account Deficit declined from about 1% of GDP last year to 0.3% of GDP in the first half of 2016-17. FDI grew 36% in H1 2016-17 over H1 2015-16, despite 5% reduction in global FDI inflows. Foreign exchange reserves have reached $ 361 billion as on January 20, 2017. War against black money launched by Government continued on path of fiscal consolidation, without compromising on public investment. Indian economy has been robust to mild shocks and IMF forecasts, India to be one of the fastest growing major economies in 2017. World economy faces considerable uncertainty, in the aftermath of major economic and political developments during the last year. The US Federal Reserve's , intention to increase policy rates in 2017, may lead to lower capital inflows and higher outflows from the emerging economies. Uncertainty around commodity prices, especially that of crude oil, has implications for the fiscal situation of emerging economies. Signs of retreat from globalisation of goods, services and people, as pressures for protectionism are building up. Passage of the Constitution Amendment Bill for GST and the progress for its introduction. Demonetisation of high denomination bank notes. Enactment of the Insolvency and Bankruptcy Code; amendment to the RBI Act for inflation targeting; enactment of the Aadhar bill for disbursement of financial subsidies and benefits. Budget 2017-18 contains 3 major reforms. First, presentation of Budget advanced to February 1 to enable the Ministries to operationalise all activities from the commencement of the financial year. Second, merger of Railways Budget with General Budget to bring Railways to the centre stage of Government’s Fiscal Policy and Third, removal of plan and non- plan classification of expenditure to facilitate a holistic view of allocations for sectors and ministries. Bold and decisive measure to curb tax evasion and parallel economy. Government’s resolve to eliminate corruption, black money, counterfeit currency and terror funding. Drop in economic activity, if any, to be temporary. Generate long term benefits including reduced corruption, greater digitisation, increased flow of financial savings and greater formalisation of the economy. Pace of remonetisation has picked up and will soon reach comfortable levels. The surplus liquidity in the banking system will lower borrowing costs and increase the access to credit. Announcements made by the Honourable Prime Minister on December 31, 2016 focusing on housing for the poor; relief to farmers; credit support to MSMEs; encouragement to digital transactions; assistance to pregnant women and senior citizens; and priority to dalits, tribals, backward classes and women under the Mudra Yojana, address key concerns of our economy. Target for agricultural credit in 2017-18 has been fixed at a record level of Rs 10 lakh crore. To ensure flow of credit to small farmers, Government to support NABARD for computerisation and integration of all 63,000 functional Primary Agriculture Credit Societies with the Core Banking System of District Central Cooperative Banks. This will be done in 3 years at an estimated cost of Rs 1,900 crore. Coverage under Fasal Bima Yojana scheme will be increased from 30% of cropped area in 2016-17 to 40% in 2017-18 and 50% in 2018-19 for which a budget provision of Rs 9000 crore has been made. New mini labs in Krishi Vigyan Kendras (KVKs) and ensure 100% coverage of all 648 KVKs in the country for soil sample testing. As announced by the Honourable Prime Minister, the Long Term Irrigation Fund already set up in NABARD to be augmented by 100% to take the total corpus of this fund to Rs 40,000 crore. Dedicated Micro Irrigation Fund in NABARD to achieve ‘per drop more crop’ with an initial corpus of Rs 5,000 crore. Coverage of National Agricultural Market (e-NAM) to be expanded from 250 markets to 585 APMCs. Assistance up to Rs 75 lakh will be provided to every e-NAM. A model law on contract farming to be prepared and circulated among the states for adoption. Dairy Processing and Infrastructure Development Fund to be set up in NABARD with a corpus of Rs 2000 crore and will be increased to Rs 8000 crore over 3 years. Over Rs 3 lakh crore spent in rural areas every year, for rural poor from Central Budget, State Budgets, Bank linkage for self-help groups, etc. Aim to bring one crore households out of poverty and to make 50,000 Gram Panchayats poverty free by 2019, the 150th birth anniversary of Gandhiji. Against target of 5 lakh farm ponds under MGNREGA, 10 lakh farm ponds would be completed by March 2017. During 2017-18, another 5 lakh farm ponds will be taken up. Women participation in MGNREGA has increased to 55% from less than 48%. MGNREGA allocation to be the highest ever at Rs 48,000 crore in 2017-18. Pace of construction of PMGSY roads accelerated to 133 km roads per day in 2016-17, against an avg. of 73 km during 2011-2014. Government has taken up the task of connecting habitations with more than 100 persons in left wing extremism affected Blocks under PMGSY. All such habitations are expected to be covered by 2019 and the allocation for PMGSY, including the State's Share is Rs 27,000 crore in 2017-18. Allocation for Pradhan Mantri Awaas Yojana – Gramin increased from Rs 15,000 crore in BE 2016-17 to Rs 23,000 crore in 2017-18 with a target to complete 1 crore houses by 2019 for the houseless and those living in kutcha houses. Well on our way to achieving 100% village electrification by May 1, 2018. Allocation for Prime Minister's Employment Generation Program and Credit Support Schemes has been increased three fold. For imparting new skills to people in rural areas, mason training will be provided to 5 lakh persons by 2022. A programme of “human resource reforms for results” will be launched during 2017-18 for human resources development in Panchayati Raj Institutions. Total allocation for Rural, Agriculture and Allied sectors is Rs 187223 crore. To introduce a system of measuring annual learning outcomes in our schools. Good quality higher education institutions to have greater administrative and academic autonomy. SWAYAM platform, leveraging IT, to be launched with at least 350 online courses. This would enable students to virtually attend courses taught by the best faculty. Skill Acquisition and Knowledge Awareness for Livelihood Promotion programme (SANKALP) to be launched at a cost of Rs 4000 crore. SANKALP will provide market relevant training to 3.5 crore youth. Next phase of Skill Strengthening for Industrial Value Enhancement (STRIVE) will also be launched in 2017-18 at a cost of Rs 2,200 crore. Mahila Shakti Kendra will be set up with an allocation of Rs 500 crore in 14 lakh ICDS Anganwadi Centres. This will provide one stop convergent support services for empowering rural women with opportunities for skill development, employment, digital literacy, health and nutrition. Under Maternity Benefit Scheme Rs 6,000 each will be transferred directly to the bank accounts of pregnant women who undergo institutional delivery and vaccinate their children. National Housing Bank will refinance individual housing loans of about Rs 20,000 crore in 2017-18. Action plan has been prepared to reduce IMR from 39 in 2014 to 28 by 2019 and MMR from 167 in 2011-13 to 100 by 2018-2020. To create additional 5,000 Post Graduate seats per annum to ensure adequate availability of specialist doctors to strengthen Secondary and Tertiary levels of health care. Two new All India Institutes of Medical Sciences to be set up in Jharkhand and Gujarat. Propose to amend the Drugs and Cosmetics Rules to ensure availability of drugs at reasonable prices and promote use of generic medicines. The allocation for Scheduled Castes has been increased by 35% compared to BE 2016-17. The allocation for Scheduled Tribes has been increased to Rs 31,920 crores and for Minority Affairs to Rs 4,195 crores. For transportation sector as a whole, including rail, roads, shipping, provision of Rs 2,41,387 crore has been made in 2017-18. For 2017-18, the total capital and development expenditure of Railways has been pegged at Rs 1,31,000 crore. This includes Rs 55,000 crore provided by the Government. For passenger safety, a Rashtriya Rail Sanraksha Kosh will be created with a corpus of Rs 1 lakh crore over a period of 5 years. In the next 3 years, the throughput is proposed to be enhanced by 10%. This will be done through modernisation and upgradation of identified corridors. SMS based Clean My Coach Service has been started ‘Coach Mitra’, a single window interface, to register all coach related complaints and requirements to be launched. By 2019, all coaches of Indian Railways will be fitted with bio toilets. Tariffs of Railways would be fixed, taking into consideration costs, quality of service and competition from other forms of transport. In the road sector, Budget allocation for highways increased from Rs 57,976 crore in BE 2016-17 to Rs 64,900 crore in 2017-18. 2,000 kms of coastal connectivity roads have been identified for construction and development. By the end of 2017-18, high speed broadband connectivity on optical fibre will be available in more than 1,50,000 gram panchayats, under BharatNet. A DigiGaon initiative will be launched to provide tele-medicine, education and skills through digital technology. Proposed to set up strategic crude oil reserves at 2 more locations, namely, Chandikhole in Odisha and Bikaner in Rajasthan. This will take our strategic reserve capacity to 15.33 MMT. For creating an eco-system to make India a global hub for electronics manufacturing a provision of Rs 745 crore in 2017-18 in incentive schemes like M-SIPS and EDF. Foreign Investment Promotion Board to be abolished in 2017-18 and further liberalisation of FDI policy is under consideration. An expert committee will be constituted to study and promote creation of an operational and legal framework to integrate spot market and derivatives market in the agricultural sector, for commodities trading. e-NAM to be an integral part of the framework. Bill relating to curtail the menace of illicit deposit schemes will be introduced. A bill relating to resolution of financial firms will be introduced in the current Budget Session of Parliament. This will contribute to stability and resilience of our financial system. Propose to create an integrated public sector ‘oil major’ which will be able to match the performance of international and domestic private sector oil and gas companies. A new ETF with diversified CPSE stocks and other Government holdings will be launched in 2017-18. In line with the ‘Indradhanush’ roadmap, Rs 10,000 crore for recapitalisation of Banks provided in 2017-18.Lending target under Pradhan Mantri Mudra Yojana to be set at Rs 2.44 lakh crore. Priority will be given to Dalits, Tribals, Backward Classes and Women. 125 lakh people have adopted the BHIM app so far. The Government will launch two new schemes to promote the usage of BHIM; these are, Referral Bonus Scheme for individuals and a Cashback Scheme for merchants. Banks have targeted to introduce additional 10 lakh new POS terminals by March 2017. They will be encouraged to introduce 20 lakh Aadhar based POS by September 2017. The Government e-market place which is now functional for procurement of goods and services. To utilise the Head Post Offices as front offices for rendering passport services. To rationalise the number of tribunals and merge tribunals wherever appropriate. Commemorate both Champaran and Khordha revolts appropriately. Stepped up allocation for Capital expenditure by 25.4% over the previous year. Total resources being transferred to the States and the Union Territories with Legislatures is Rs 4.11 lakh crore, against Rs 3.60 lakh crore in BE 2016-17. For the first time, a consolidated Outcome Budget, covering all Ministries and Departments, is being laid along with the other Budget documents. FRBM Committee has recommended 3% fiscal deficit for the next three years, keeping in mind the sustainable debt target and need for public investment, fiscal deficit for 2017-18 is targeted at 3.2% of GDP and Government remains committed to achieve 3% in the following year. Net market borrowing of Government restricted to Rs 3.48 lakh crore after buyback in 2017-18, much lower than Rs 4.25 lakh crore of the previous year. Revenue Deficit of 2.3% in BE 2016-17 stands reduced to 2.1% in the Revised Estimates. The Revenue Deficit for next year is pegged at 1.9% , against 2% mandated by the FRBM Act. Between November 8 and December 30, 2016, deposits between 2 lakh Rupees and 80 lakh Rupees were made in about 1.09 crore accounts with an average deposit size of Rs 5.03 lakh. Deposits of more than 80 lakh were made in 1.48 lakh accounts with average deposit size of Rs 3.31 crore. For builders for whom constructed buildings are stock-in-trade, tax on notional rental income will only apply after one year of the end of the year in which completion certificate is received. Exemption from capital gain tax for persons holding land on 2.6.2014, the date on which the State of Andhra Pradesh was reorganised, and whose land is being pooled for creation of capital city of Andhra Pradesh under the Government scheme. Concessional withholding rate of 5% charged on interest earned by foreign entities in external commercial borrowings or in bonds and Government securities is extended to 30.6.2020. This benefit is also extended to Rupee Denominated (Masala) Bonds. For the purpose of carry forward of losses in respect of start-ups, the condition of continuous holding of 51% of voting rights has been relaxed subject to the condition that the holding of the original promoter/promoters continues. Also the profit (linked deduction) exemption available to the start-ups for 3 years out of 5 years is changed to 3 years out of 7 years. MAT credit is allowed to be carried forward up to a period of 15 years instead of 10 years at present. In order to make MSME companies more viable, income tax for companies with annual turnover upto Rs 50 crore is reduced to 25%. Allowable provision for Non-Performing Asset of Banks increased from 7.5% to 8.5%. Interest taxable on actual receipt instead of accrual basis in respect of NPA accounts of all non-scheduled cooperative banks also to be treated at par with scheduled banks. Basic customs duty on LNG reduced from 5% to 2.5%. No transaction above Rs 3 lakh would be permitted in cash subject to certain exceptions. Need to cleanse the system of political funding in India. Maximum amount of cash donation, a political party can receive, will be Rs 2000/- from one person. Scope of domestic transfer pricing restricted to only if one of the entities involved in related party transaction enjoys specified profit-linked deduction. Threshold limit for audit of business entities who opt for presumptive income scheme increased from Rs 1 crore to Rs 2 crore. Similarly, the threshold for maintenance of books for individuals and HUF increased from turnover of 10 lakhs to 25 lakh or income from 1.2 lakh to 2.5 lakh. Foreign Portfolio Investor (FPI) Category I & II exempted from indirect transfer provision. Indirect transfer provision shall not apply in case of redemption of shares or interests outside India as a result of or arising out of redemption or sale of investment in India which is chargeable to tax in India. Commission payable to individual insurance agents exempt from the requirement of TDS subject to their filing a self-declaration that their income is below taxable limit. Under scheme for presumptive taxation for professionals with receipt upto Rs 50 lakh p.a. advance tax can be paid in one instalment instead of four. Existing rate of taxation for individual assesses between income of Rs 2.5 lakh to 5 lakh reduced to 5% from the present rate of 10%. Surcharge of 10% of tax payable on categories of individuals whose annual taxable income is between `50 lakh and Rs 1 crore. Simple one-page form to be filed as Income Tax Return for the category of individuals having taxable income upto Rs 5 lakh other than business income. Appeal to all citizens of India to contribute to Nation Building by making a small payment of 5% tax if their income is falling in the lowest slab of 2.5 lakh to 5 lakh. Maximise efforts for e-assessment in the coming year.